I am married to a man who can’t handle anything spicier than a green pepper. For a girl who likes her food to have a certain level of va-va-voom, this means that I have to do a judicious amount of doctoring at the table to satisfy my taste buds. 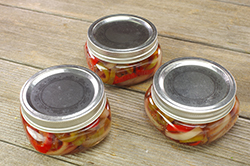 To that end, I keep bottles of sriracha and sweet chili sauce on the fridge door and, every fall, can up a bunch of pickled hot peppers. 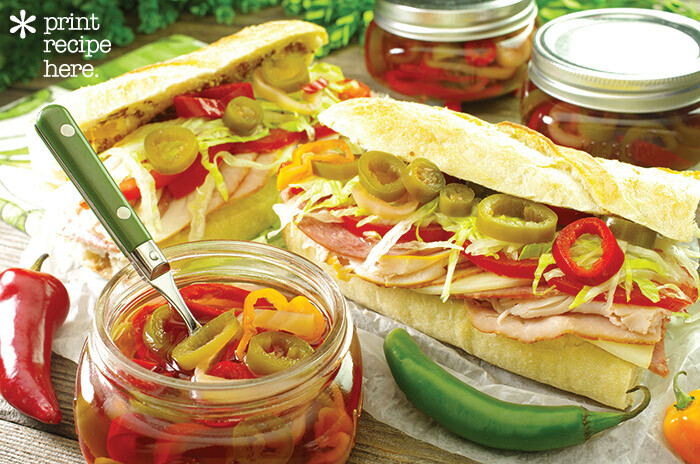 I keep the brine unseasoned so they work just as well on sandwiches as they do chopped and stirred into homemade salsa. The other nice thing about this recipe is that comes together in about half an hour. 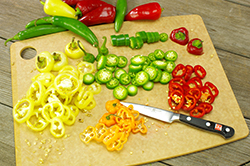 If you’re exhausted by your garden and just want to be done with your pepper plants, this approach is a really good answer. Prepare a small boiling water bath and 3 half-pint/250 ml jars according to the process [see below]. 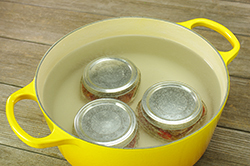 Place 3 lids in a small saucepan of water and bring to the gentle simmer. 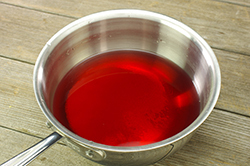 Combine the vinegar, water, and salt in a separate saucepan and bring to a boil. 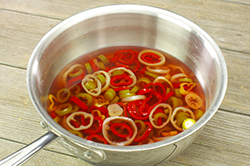 When the brine is boiling, add the pepper rings and stir to submerge. As soon as the brine returns to a boil, remove the pot from the heat. 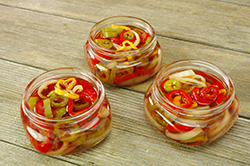 Funnel the peppers into the prepared jars and top with the brine, leaving 1/2-inch/12mm of headspace. Tap the jars gently to remove any air bubbles. Add more liquid to return the headspace to 1/2-inch/12 mm, if necessary. 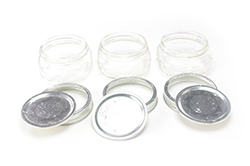 Wipe the rims, apply the lids and rings, and process the jars in a boiling water bath for 10 minutes [see below]. 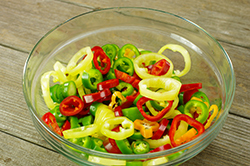 The pickled pepper rings are ready to eat within 48 hours. 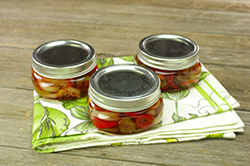 Note: Save any pickling liquid leftover from this recipe and use it in vinaigrettes or to season sandwiches. 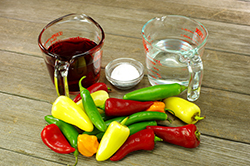 The hot peppers will have given it some of their flavor and so it will be just slightly spicy.